it seems that I have much angst when it comes to wearing them, as I typically fret over what to wear on top and/or finding the right leggings, tights, or shoes for down below. 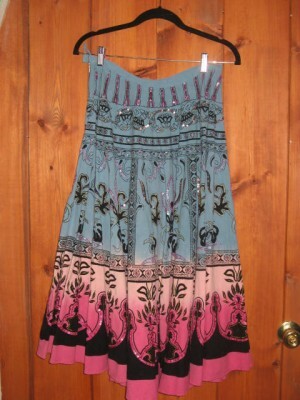 This is a new-used Mexican skirt that I bought in a Scottsdale consignment shop for $13. Here’s a hand-painted vintage Mexican model that I bought for $5 from a friend. 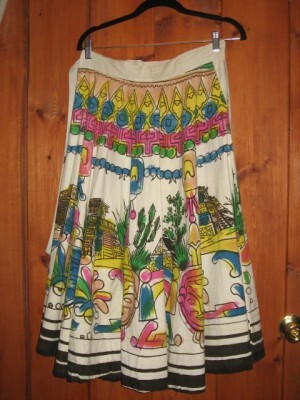 This consignment shop sweetie was made in Paris! 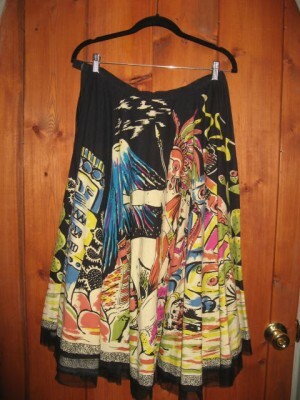 And this is my long-time favorite ‘artsy’ skirt. so I thought that adding an underlayer of a slip or another skirt might make them appear longer (which I prefer since I’m such a shortie) and update them a bit. and publicly record my progress! Linking with Patti’s Visible Monday @ http://notdeadyetstyle.blogspot.com/. ~ by admin_aef on April 28, 2013. That is an awesome goal! The Frida Project! 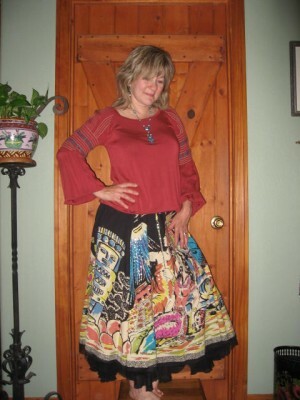 These skirts are all so fabulous – I have a thing for painted circle skirts and you look great!! Thanks for sharing your look with Visible Monday. These skirts are a beautiful collection, so colorful! They look fun to wear. I absolutely adore them. If, ever you think of getting rid of them, please think of me! I will buy them up in a snap! Your favorite is my favorite, I love the faces hiding in the folds of the skirt!!! Yay, I want to receive follow-ups so had to add this! You should wear them often!! 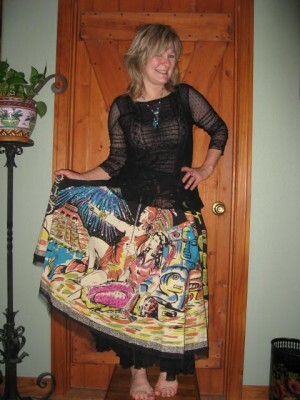 Wow, you are skirt collector, and you have some fabulous ones at that. I think your personal challenge is a fantastic idea. I look forward to seeing all the different ensembles you put together. Wow, what a wonderful collection! The skirts are so beautiful, so unique. My fav are on the first and second photos. I also love skirts above every other item of clothing. I am digging yours, ahhhhhhh. I love every single one! I simply can’t decide on my fave. I like the way you’ve kept it simple on top with the black top. You made me remember that I bought a fab skirt similar to yours at a garage sale – then gave it away when I moved overseas, wah! Those skirts are gorgeous! 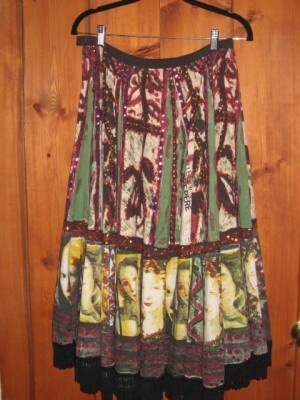 I like that one you’re wearing with the black top best, but that art skirt is so cool!! You definitely need to wear these often. No …these are very cool. Global looks are very current, and you have a specific take on this cultural link to where you live and what you love. Very, very cool. Great looking skirt! I have something similar from Disegual and your pictures remind me that I need to dig it out soon! These skirts are so cool and must look amazing styled in a bunch of ways. I also saw your artwork and I’m a huge fan.